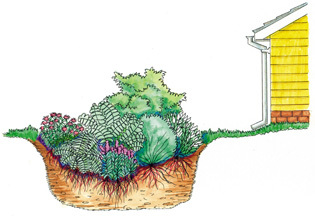 Rain gardens are landscape features designed to capture and naturally filter storm water. Also called bioswales or biofiltration gardens, these gardens use planted, shallow depressions to collect, slow down, and spread water over a larger area to allow it time to soak into the ground rather than flow into storm sewers and ultimately into nearby waterways. Rain gardens require very little, if any, watering and less water usage means lower water bills. This also helps reduce wasting drinking water. In an urban setting such as the District of Columbia, more than 40 percent of the potable water supply is used for gardening and other outdoor activities. Rain gardens capture runoff and slowly filter out common pollutants and sediment. Less storm water runoff -- runoff can cause erosion and often carries pollutants from streets and other paved surfaces. Reducing the volume of this contaminated water running into sewer drains helps reduce polution flowing into local waterways. With appropriate plants, rain gardens provide attractive habitats for birds, butterflies and beneficial insects. Rain barrels are a centuries-old technique to collect rainwater from roofs. Rain barrels attach to the downspouts at your home or business and help keep groundwater and waterways clean. You can find rain barrels for sale in garden centers and online. Why Have a Rain Barrel? 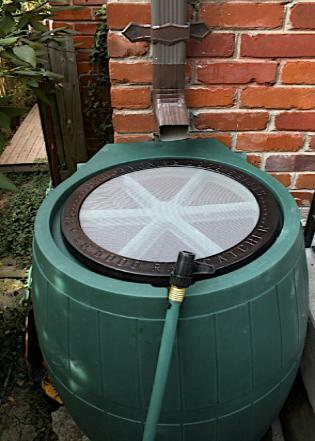 Low-cost water conservation device that can be used to reduce runoff. Help delay and reduce the peak runoff flow rates. Clean water for healthy gardens and lawns. Help delay the need to expand sewage treatment facilities. 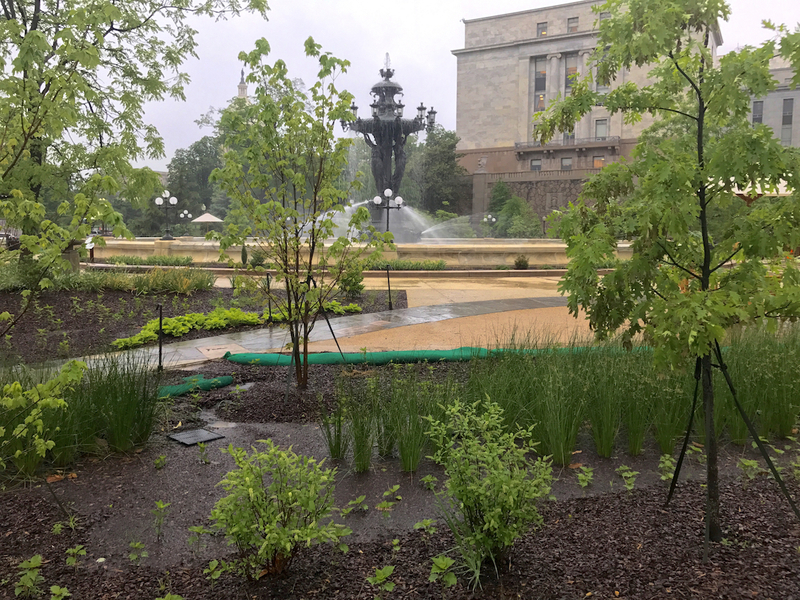 In the recent renovation of Bartholdi Park, 10 new rain gardens were created, featuring a wide variety of plants that can tolerate the long periods of little water between brief inundations during rain events. 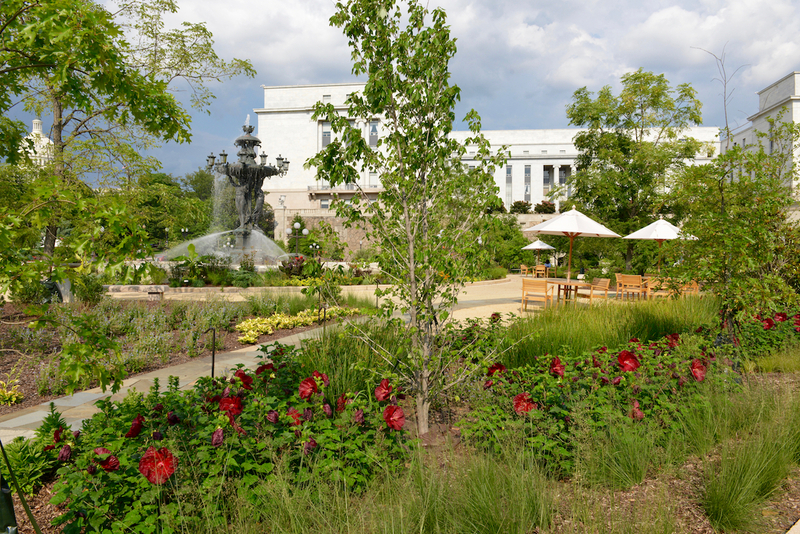 Rainwater in Bartholdi Park: Ten rain gardens capture 100 percent of rainfall on the site and allow it to soak into the ground, diverting runoff from D.C.'s combined sewer system. The rain gardens can accept up to 4,000 cubic feet of water in a 24-hour storm event - equivalent to 256 bathtubs of water. The project also used permeable paving and reduced the amount of impervious surface. The rain gardens in Bartholdi Park feature plants not found as frequently in other rain gardens, like this blooming red hibiscus and juncus combination. This photo shows the rain garden from above capturing rain during a rain event. The photo was taken a few months earlier in the year before the hibiscus has grown large.